Pedro has been a member of the Rotary Club of Chicago since 2001. He is a multiple Paul Harris Fellow, a Major Donor of the Rotary Foundation and a member of the Paul Harris Society. Pedro is a founder, CEO and President, Transportation & Infrastructure at Primera Engineers, Ltd. His responsibilities include overseeing infrastructure and transportation projects. Prior to starting Primera, he served as a faculty member at the Illinois Institute of Technology. During his 30 plus year career, Pedro has been involved in over 400 engineering projects. A native of Ecuador, Pedro received a B.S. in Civil Engineering from the University of Puerto Rico and a M.S. and Ph.D. from the University of Illinois at Urbana-Champaign. He is a Registered Engineer in Illinois, Wisconsin, Pennsylvania, Texas and Michigan. Pedro was recognized by the University of Illinois Alumni Association with the 2015 Chicago Illini of the Year award. Pedro has been a leader for the empowerment of Hispanic professionals in the Chicago area. He was a founding member of the Chicago Chapter of the Society of Hispanic Engineers (SHPE) and was involved on the formation of the Hispanic Alliance for Career Enhancement (HACE). He is an active member of many engineering professional societies and has served on the Board of Directors of several of them, including serving as President of the American Council of Engineering Companies of Illinois in 2010. He is currently the Chairman of the Board of the Illinois Hispanic Chamber of Commerce. 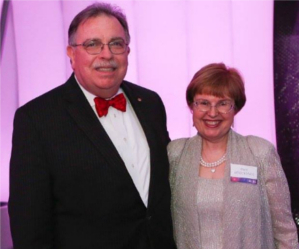 Dr. Cevallos-Candau has been married to Rotarian Pam Brockman (Chicago Little Village) for 30 years. They reside in Northbrook and have a son Antonio.